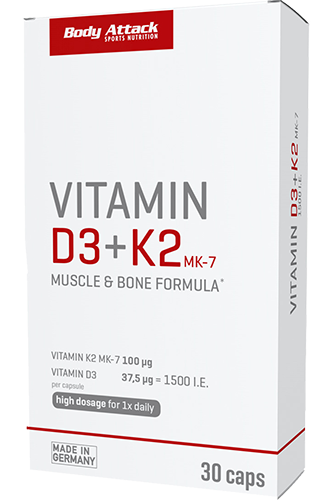 Body Attack Vitamin D3 + K2 is the perfect formula for muscles and bones. Body Attack Vitamin D3+K2 MK-7 is the strongest and most efficient vitamin D and K supplement on the market. These forms of the vitamins provide for best bioavailability and thus an increased benefit. Vitamin K2 MK-7 is gained entirely from plant-based raw materials and can be better absorbed by the body than many other forms of vitamin K.
Both vitamins are provided as biologically active forms, which enables the body to absorb them better than ergosterol (vitamin D2) and phyllochinone (vitamin K1), for instance. The absorption rate of vitamin K2 is six to eight times higher compared to that of vitamin K1. This is mainly due to the biologically active form of vitamin, menaquinone-7 (MK-7), or MK7 in short. In other words, we use a 99% all-trans form of vitamin K2, which can be much better absorbed by the body. The 99% all-trans form of vitamin K2 MK-7 thus provides an increased bioavailability and is the gold standard among the various forms of vitamin K.
These two vitamins complement each other perfectly and should therefore be taken together. This is the only way to supply the teeth and bones with calcium. The sole intake of high-dose vitamin D3 can lead to a higher consumption of vitamin K2. Over time, a resulting vitamin K2 shortage may imbalance the calcium metabolism. A long-term shortage may even generate deposits in the blood vessels and organs. Vitamin K2 has a preventive effect on the development of arterial calcification (arteriosclerosis) and is also responsible for the elasticity of the vascular walls. Together with calcium, vitamin D3 and K2 generate transport proteins which ensure normal blood clotting. This is important for the repair and healing process of the body as well as for the prevention of thrombosis, i.e. the formation of blood clots resulting in a life-threatening blockage of the blood vessels. Also, the muscles require calcium for contraction, as the provision of the muscle fuel ATP is only possible with this mineral. Both vitamin D 3 and vitamin K2 are necessary for a normal muscle function, the muscle metabolism as well as for the generation of new muscle tissue. For whom is it recommended?